Why water melon diet is good for you? In our modern society, where technology has advanced so much that you don’t need to put much effort into doing some physical work and where junk food is easily available, whenever you feel hungry what comes to mind? Most would say pizza, burgers etc. In such situation, it is very easy to put on extra weight and very difficult to maintain healthy weight while keeping your body in shape. Are you trying to shed extra weight that you have put on and nothing is working for you? Or you have those nasty genes from your family that make your body heavy even if you have been careful regarding your eating habits or daily exercise? Or you have the natural tendency to put on weight easily but due to your busy schedule, you can’t spend enough time in making diet meals or following long exercise plans? Or you are giving your best to but still are not getting enough feedback? Do you feel tired of all those diet plans, calories charts and exercise schedules? Nothing seems like a solid plan for stopping your body and you have ended up cursing all those diet plans, calories charts and to your body for becoming fat easily. You might have started thinking that diet plans don’t work for you. In that case, you are absolutely right. Traditional and typical diet plans don’t work much effectively, especially on long term basis. The key point is to change your eating habits to healthier foods, not only for reducing weight but also for healthier body. This summer you don’t need to cut down your meal or starve yourself for being in shape. Water melon diet might be the answer to your problem. On long term basis, only that kind of diet works that is rich in nutrients but low in calories and fats. Water melon is one of those low calories and highly nutritious food. All the water melon diet plans are inexpensive and easy to follow. Just follow one of the diet plans which are mentioned below. You don’t need to do much work out with these diet plans. Within the given time period, you will start to enjoy the miracle of this diet plan and will love watching your body getting slim and pretty. Constituents of water melon are very good body cleanser and detoxifying agents. They clean your body of all harmful chemicals. With every juicy bite of water melon, you get rich amount of vitamins A, C, B6, potassium, lycopene, amino acids and antioxidants. Lycopene is a red pigment that is a very powerful antioxidant. It starts many reactions in body that have health benefits. It is very good for heart health, bone health and preventing many cancers. In addition, it is also a very good diuretic food. That means, it helps in removing excess water and salts from your body by increasing urination. All those excess salts and water in body might make your body bloat and fatty. By this diuretic action, you will get rid of all those bloating salts and water from your body, thus helping you in weight reduction. It keeps your body hydrated, helps in digestion, makes skin and hair healthy, reduces body swellings and helps in cancer prevention. This plan can also be called a detox diet, which is actually a bonus point of this diet. This diet not only helps in reducing weight but also helps in detoxifying your body from all harmful buildups. This diet is very easy to follow and it is delicious as well. You don’t need to shove down tasteless food any more. This diet is based on 2 steps plan. This step actually consists of consuming just one kind of food, which will be water melon. You will have to eat just water melon for 3 days, nothing else. There is no restriction in the quantity. You can eat it to your heart’s content. As this stage last for only 3 days, most probably there will be no ill health effects for healthy individuals. Basically this step of diet is restrictive step, where you restrict your calories and nutrients by solo use of water melon. This stage actually consists of two different kinds of meals a day. In between those meals, water melon will be used whenever you feel hungry or want to have a snack. The duration of this stage will be from 6 to 10 days, whatever the duration you like. The best way of following is to follow this step for minimum number of days i.e. 6 days. This step of diet is not restrictive rather it gives some variety of foods for your consumption. NOTE: As you will be using plenty of water melons during this diet, you don’t need to drink plenty of water with this. Just drink plain water whenever you feel thirsty between the meals. One bowl of salad. You can use whatever fruit or vegetable you like. You can dress your salad with a small amount of olive oil, vinegar or lemon. Nothing else should be used. Like the long term water melon diet plan, this one also has great detoxifying effects on your body. It is different from long term diet as it is shorter in duration and greater variety of meals are used in it. This is very effective diet plan but it works only when you follow it as it is and don’t alter the plan much. In other words, you are not allowed to add extra calories in this diet plan. Just try to follow it as it is and enjoy the results. Target weight loss: Depends on your body metabolism and other factors but this will definitely give you good amount of weight shedding. Replace all your soft drinks and even juices with water melon and water. During your routine meals, try to reduce its portion size. Having small portion of meal is a solid way of reducing weight. You can substitute the reduced amount of your food with water melon. By this way, you will trick your mind into thinking that you are eating as much as you want and it will also give you satiety. Actually, by adding water melon, you are replacing your food with low calories, high nutrition food, which will eventually help you in shedding extra calories, without pushing you into a state of starvation. As a dessert or snack, eat water melon. The major portion of calories is in fatty food. So, first of all you should try to locate all fatty foods that are a part of your daily meals. Now the question is which foods are fatty? Answer is quite simple and easy. All those foods that are creamy in texture are fatty foods. If it is less creamy, it will be having fewer fats in it. If it is much creamer then it will be having more fats. Thus, butter, sandwich spread, ice cream, gravies and cheese will naturally be having large content of fats in them. There are some exceptions to this rule as well. Like yogurt, it doesn’t contain high fats content in it and is good for your health. As you also might know that all fried foods like fried chips, donuts etc are obviously high in fat content. Even among drinks, milk contains good quantity of fat in it. The most important thing is you should not forget to locate those foods that don’t look like fatty foods but once you have eaten them, they are going to convert into fats inside your body. These are sugar containing foods like cookies, soft drinks, cakes and breads etc. The calories from these foods are ultimately converted into fat. So, before taking anything, make it a habit to read the label of contents of food. Once you have located and counted the fatty foods in your daily diet, try to reduce the amount of those fatty foods from your diet. The idea is to replace those fatty foods with natural fruits and vegetables. Among these fruits and vegetables, water melon is the target fruit that you will be using in the water melon diet. Now the question is why water melon should be the choice? It is easily available and cheap fruit. It has high water and fiber content in it. Moreover, it is very low in calories and high in nutrition. You can have as much as you want without worrying about any calories. High water content of this fruit gives you satisfaction of being full with small amount. So, you will be replacing the major content of your high fat and high calorie diet with low calories, low fats and highly nutritious water melon. The goal is to limit yourself to one fatty meal and one fatty snack a day. You can have water melon for the whole day instead of anything else. The fatty meal and snack should be nutritiously balanced and the rest of the diet during the day will be of healthy water melon. You can have whatever you like but the food should be low in fats, sugar and flour etc. Try to have water melon as a major content of your supper and dinner. You can have one fatty snack like one small bowl of ice cream, small piece of cake or small glass of milk shake, during the whole day. In between the meals or as another snack, you can have only water melon. You should avoid all kinds of soft drinks, even so called diet soft drinks are not allowed. If you want to have something refreshing as a drink, you can blend chilled water melon in a shaker to make a refreshing smoothie. One important point that you should keep in mind is that while following the diet plan, you should not stuff yourself continuously in between the meals thinking water melons as low calorie and good for your health. You should have them whenever you feel hungry. Stuffing yourself continuously of even low calorie food won’t be doing any good to you. Watch out the amount and timings of foods that you take. As a general rule, you should not have more than 5 meals (including breakfast, lunch, dinner and snacks in between the meals) a day. With this diet plan, you need to do a little work out which might be 15 minutes exercise or a 30 minute walk. Thus, after following this combination of fat substituting diet and some work out plan, you will definitely shed good amount of weight. The good point of this diet is that you can follow it on long term basis. You don’t need to starve yourself and it is easy to follow. This is mainly a short duration detox diet that is very good for cleansing your body of harmful chemicals from time to time. In this diet, no special supplements or herbs are needed. You just need to buy three large sized water melons Water melons should not be of seedless variety. You can follow this diet twice or thrice a year, in order to clean your body. The goal of this diet is to eat one water melon a day. You can eat water melons in different days. You can have it by cutting it into small chunks and cooling them in refrigerator. You can also make a smoothie by blending it in a blender. You can also make water melon salad, which is very easy to make. In order to make this salad, cut a portion of water melon into a bowl then add some chopped lettuce, spinach leaves, green onions and cucumber etc. or whatever you like to add. You can add a few drops of olive oil, vinegar or lemon as dressing. Toss it well. There you go with delicious water melon salad. While eating water melons, try to eat the seeds as well as they are good for your kidneys. Although by the end of 3rd day, you might be sick of water melons but the good news is you will be having healthier body. After these three days of water melon diet, you should start taking other foods slowly. Among these foods, you should prefer eating healthier foods and move on to routine fatty, processed food slowly. On 4th day, you can have other fruits, salads or soups. This is done to keep your stomach in relaxed state as it has been after the detox diet. With the passage of time, you can switch slowly to regular food. CAUTION: If you are suffering from any long term illness, you should consult your physician first before starting this diet. After starting the diet, if you feel any kind of discomfort then you should stop the diet immediately. This diet is best for individuals who don’t have any illness and are healthy. If you are suffering from diabetes, kidney stones, pancreatic disease, hypertension or any other long term sickness then this diet is not for you. In that case, you can consult your physician and by his help you can alter this diet plan according to your best interest. 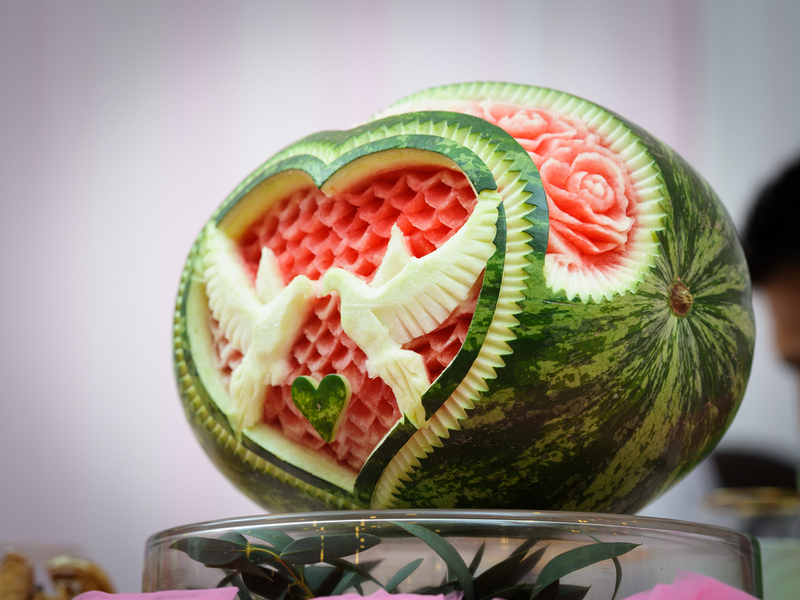 Among these diet plans where only water melon is used for the whole day, you should not exceed the days of plan. The best way is to follow the days as mentioned in the plan. Although in many diet plans, it has been mentioned to eat as much water melon as you want to but the best way is to eat one pound of water melon for every 10 pounds of your body. As water melons contain good quantity of lycopene, you should not over dose yourself with this pigment. Excess of this pigment is also harmful to your body. So, you should always use moderate amount of water melon. While on water melon diet plan, you should also watch out your blood sugar levels. Although the sugar in water melons is natural sugar but still they are packed with plenty of natural sugar that might shoot your blood sugar level. Even if you are healthy, always consult your physician before starting any diet plan. Excess use of water melon can eventually make your body dehydrated so always keep on drinking water. After following diet plan because of calories restriction and little food variety, you might start over eating and end up putting back the weight that you have shed before. Thus, after finishing the diet plan, move on to routine foods slowly by using more of nutritious foods like juices, soups and fruits etc. With the passage of time, you can switch slowly to the regular food while making your stomach familiar of them once again. With the water melon diets that are mentioned before, you don’t need to do much work out. These diet plans are already having restrictive calories. With excessive work out with these diet plans, you might suffer from under nutrition that will be harmful for your body. So, during this diet plan do light workout, if you feel yourself dizzy, light headed etc then you should stop the work out immediately. Whatever is the type of diet plan, it needs lots of patience and self control to follow it. You should follow the diet plan with patience and try not to alter the plan. Persistence is the key factor of any diet plan. Some people have much stubborn type of body than others. They might not get the same weight reduction target like other people do or mentioned in the diet plans. They should not freak out and must follow the diet plan patiently, in order to have the positive result of the diet plan lately. Eventually their weight will reduce. So, even if no diet plan has worked for you in the past give this diet plan a try and work on it. You will definitely enjoy the effects of this diet plan. After all, by following this diet plan you will be having nothing to lose but just your weight.